On-the-job accidents are more common than many people realize, and accidents involving machinery are a leading cause of on-the-job injuries and fatalities. 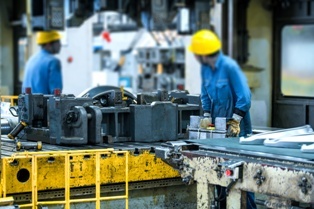 Workers in the construction, manufacturing, mining, agriculture, transportation, oil, and refuse waste and scrap material industries are most at risk for machinery-related accidents, as they may routinely work with potentially hazardous equipment like forklifts, cranes, bulldozers, tractors, power hammers, and conveyor belt systems. And even when the workers who operate this equipment are highly skilled and observe proper safety precautions, moving machinery has the potential to cause serious injuries under the right circumstances. Unlike personal injury cases, injured workers are not required to prove fault or negligence in order to collect benefits through the workers' compensation system. They only have to prove that their injuries occurred during the course of their employment. If you were seriously injured in a machinery accident at work, it's important to understand your legal rights and options. The knowledgeable attorneys with the Morris James Personal Injury Group can help ensure you receive the workers' compensation benefits you deserve. Contact us today to schedule an appointment for a free initial case analysis.